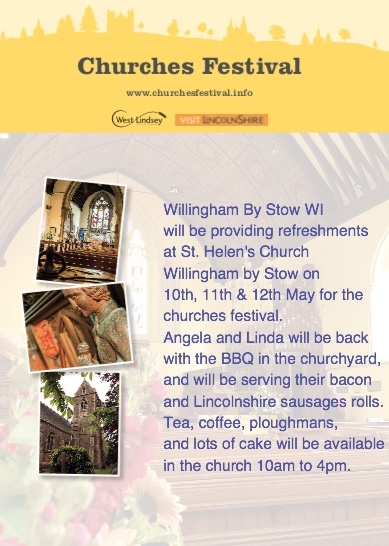 Willingham by Stow Women’s Institute was started in 1934 and has had an unbroken history ever since. We meet on the first Thursday in each month at Willingham Village Hall at 7.30pm. The President is Angela Borman and the Secretary is Ann Cragg. I list below a brief outline of the themes we intend to follow in the coming year 2018/19. April 5th – Karen Crow (Lincoln Town Crier) will be talking about her work and the interesting things that happen while doing it. May 3rd – This is our resolution Meeting and this year the topic being taken forward to national level is “Mental Health Matters as much as Physical Health”. We also have a supporting speaker, Emma Butcher, who will be talking about Adults Supporting Adults. Come along if you wish to learn more. June 7th – We have been lucky enough to have booked Reuben Lopez (The Chief Archaelogist on the Lincoln Eastern Bypass) who will be telling us about the interesting facts and finds made during the construction of this new route. July 5th – Anglian Water will be looking to the future with their plans and your ideas on what you want to see from this vital service provider. August 2nd – Lincs and Notts Air Ambulance will be telling us about their work. September 6th – June Fray will be taking a hands-on session of willow weaving. Always a very popular event. October 4th – Giles Braithwaite will be giving an informative talk on his travels and the wildlife to be found in Madagascar. November 1st – We will be having a hands-on evening of imaginative and decorative card making. December 6th – A guided tour of Gainsborough Old Hall with the option of a pre-tour lunch in their café. Further events are planned for January, February 2019 ending with our annual general meeting in March. We have a facebook page that will give more details month by month and pictures and comments from events that have gone by.